The Miami Dolphins played horrible host on opening day of the NFL's 2014 season! Their visitors. The New England Patriots had won ten straight season openers as the AFC East Divisional Champ in eleven of the last twelve seasons. The Dolphins won. Hold-up. Wait. YES! On this day your favorite team did all the roaring! In forcing the Patriots opening series to go three and out, Rookie Chris McCain followed with a blocked punt giving the Dolphins a short field and an easy short TOUCHDOWN pass from Ryan Tannehill to running back Lamar Miller for an early tempo setting 7 - 0 lead. Despite following up the great start with early first quarter injuries to starting linebackers (Ellerbe and Misi) over a three play stint which resulted in the Pats proceeding to pick at the already suspect position (for a period of time). With Miami's third starting linebacker Phillip Wheeler being declared as inactive before the game, the Dolphins were forced to play with two backup's and a defensive back at the LB position for much of the day. Simultaneously. The offense was committing three turnovers in five first half possessions, (two fumbles via huge hits, and an interception). However. 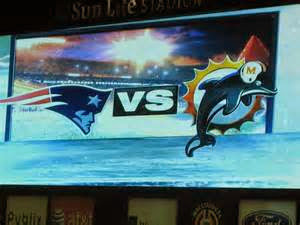 Your Miami Dolphins prevailed over the Daunting New England Patriots for a second consecutive head to head VICTORY! Miami walked out of the tunnel after halftime down by a score of 20 - 10. They received the second halves opening kickoff and proceeded to score TWENTY-THREE UNANSWERED POINTS! Free Agent running back acquisition Knowshon Moreno led the way offensively with 134 yards on 24 carries including a bruising, game clinching four yard TOUCHDOWN run through a handful of defenders. The Fins accumulated 192 total rushing yards behind (five new offensive lineman, a first in NFL history)! Ryan Tannehill went 18 of 32 for 178 passing yards with two TOUCHDOWN passes, ONE SACK, and one interception. Receiver Mike Wallace had 7 receptions for 81 yards and a TOUCHDOWN while failing to toe tap a beautiful second long touchdown reception. Running back Lamar Miller had 11 carries for 59 yards, and 4 receptions for 19 yards with a TOUCHDOWN, while having a rushing touchdown nullified due to a penalty. Meanwhile, the Fins Defense shut down the 2nd half Patriots for approximately 57 net yards and ZERO POINTS in seven possessions! Miami's defense relentlessly poured on the heat with four second half sacks of Tom Brady. Cameron Wake led the way with two plantings of the quarterback to go with two Brady forced fumbles recovered by Miami's FA safety acquisition Louis Delmis, and Rookie DT Anthony Johnson. Rookie LB Chris McCain and Dolphin standout Olivier Vernon executed the other two setting downs of the great Tom Brady. The New England Patriots wilted under the pressure of SIX (3 & outs), and TWO (4 and outs)! For the defense it was like groundhog day, and the swarm never allowed the the QB to see his own shadow, let-alone his receivers. On Offense while Miami marched up and down the field with relative ease! It was similar to the Good'Ole'Days with aggressive play calling at a blinding pace, and five to 15 yards gained, play, after play, after play. Also similar to the "Good'Ole'Days" was the announcers saying MORENO this, MORENO that for big gains and ""another Miami Dolphins first down"", time, after time, after time. A similarly named HERO that goes by MORENO led the way while motivating an ENTIRE TEAM EFFORT! Was it mentioned that your Miami Dolphins stomped the New England Patriots in a more impressive fashion than the THIRTY-THREE to TWENTY score might indicate? Dolphins win, Dolphins win, DOLPHINS WIN!! Thank You for an Open-Minded read, and we look forward to your angle of view!! STANDING OVATION, YEEEEEE HAAAAAAA, GIGGGGIITTTYYY, GO MIAMI DOLPHINS!! !